When you want to let the big guy know that you appreciate him on your big day, consider some of the anniversary wishes options below. You made me one happy girl many years ago. I’d like to return the favor on our big day. We may not be newlyweds anymore but we’re doing a great job of fooling the rest of ‘em. I am so glad you’re a part of my life. I’d marry you all over again – if just for the honeymoon! You’re my best friend – always have been and always will be. Happy anniversary to my Hunk! I am so thankful to be able to share my life with you. I can’t imagine living my life without you by my side. I could very easily get lost in your beautiful blue eyes. Love our laughter, our joy, our life. I love you. The words, “I love you” can be said in so many different ways but it can never be said enough. I love you. I love you to bits. Piece yourself together and come give me a kiss to celebrate our anniversary. As Sam Cooke said, “You send me.” Let’s celebrate. Wishing you a happy anniversary and sealing it with a kiss. To quote Shakespeare, “It’s better to have loved and lost – wait, let me change that: It’s better to have loved. My flame burns ever brighter for you. Happy Anniversary! You’ve always made me feel like the luckiest girl in the world. I’m forever grateful. I don’t want to even think about the grim reality of where I’d be without you. You mean the most to me! The man of my dreams – always and forever. Happy Anniversary to my sweetheart and best friend. 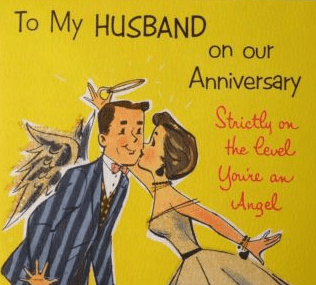 To my husband on our Anniversary – one simple message: I LOVE YOU! The happiness wedding brings is unmatched except for every day I spend with you. Many years ago, I gave you my heart. You’ve given me so much more. I love you always. It’s been no labor of love to be with you – It’s as easy as pie! Wikipedia should have a photo of you in their “Perfect Husband” listing. Our date to remember has a 60’s theme – that’s right, it’s a love-in! You turned my world around and it’s still spinning – I love you. When I’m with you, I’m in heaven. When I’m without you, I’m thinking of you. Happy anniversary to the one I love. I did not know the true meaning of LOVE until I met you. I love happy times together and hope there will be many more. Thanks for being you! I love you soooo much! You make my heart beat faster every time I see you. I wouldn’t change a thing about you. I LOVE YOU. Three words to let you know that you mean the most to me. Happy Anniversary. I love your eyes, I love your smile, and most of all, I love your style. You’re the best! You’ve always been the life of my party. Happy Anniversary! You’re the reason Facebook considered a “Love It” button. “Like It” wasn’t enough. Your love makes me the best I can be. Thank you and Happy Anniversary to my true love. When you asked me to marry you many years ago, it was the easiest and best decision of my life. Thank you! I love our love. Happy Anniversary! I don’t know how many ways there are to say, “I Love You.” But, tonight I’m planning on counting. Never going to let you go – I’m hanging on for the long run. I’m thinking candlelight dinner, dancing and you! There’s no finish line in this race. We’ve got to just keep running. My heart beats only for you. Let’s have a lovely anniversary. Two beating hearts and one shared life – I wouldn’t have it any other way. Cheers! If it gets any better than what we have, I’d have to see it. Thanks for all you do and happy anniversary to my best friend. Heaven sent an angel to my door because I feel like I’m in heaven when I’m with you. Congratulations to my true love. You’ve always been the one that I want – and we can talk about that later. Let’s celebrate! There’s peace and happiness in togetherness. Congratulations on another year of being right where we belong — together! I found love looking into your eyes the first time we really talked. I never want it to end darling. …And many more! One look, and you can drive me crazy with love. I feel sorry for all the other wives. Why did you have to be so great? If you have any suggestions for this page, please let us know by contacting us. Also, please check out the links below for more. To help you craft that perfect message, we provide lots of examples for you to consider. Thanks!